Welcome back, stamping friend! I’m back with assorted cards sharing; the rest of the cards from my Chicks & Chocolate card class last weekend; you can see more details about the class in yesterday’s post. As not everyone needs a Mother’s Day card, or multiples of them, I like to offer a class that has cards for various occasions. I also have different sentiment stamps available, and always encourage my customers to use the one they find most appropriate. I did create this card using a Mother’s Day sentiment on the front, but some of the ladies did change it to suit their need. Although the stamp set (A Nice Cuppa) and the Fruit Stand Designer Series Paper are both retired, the colours are not! I love the Peekaboo Peach and Pear Pizzazz for this card – it’s so bright and cheery. The lovely layering of the DSP and cardstock bring out each of the colours. Finishing off the card front are the cute bow, and scattered pearls. Of course, you have to finish off the inside of the card, as well! 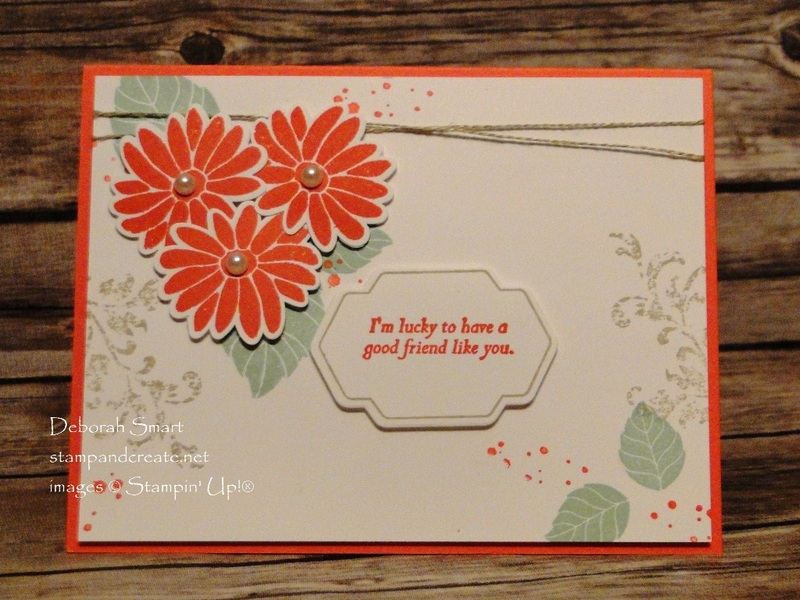 The sentiment is from the retiring Suite Sentiments stamp set, in Peekaboo Peach ink. We added a strip of the same pattern of DSP from the front, to the bottom of the inside. I know that every stamp set can’t carry over from the Occasions catalogue, but I do admit to being very disappointed that this Special Reason stamp set and coordinating Stylish Stems Framelits are not carrying over 🙁 This card also uses 2 of my favourite retiring In Colours – Watermelon Wonder and Mint Macaron. Luckily the Timeless Textures stamp set will still be available! Although the Pearls Embellishments are on the retiring list, they will be coming back – just in reconfigured packaging. Don’t you just want to hug this bear?! Thanks to the 3 step stamping of the Baby Bear stamp set, this bear looks ready to be hugged. The colours used for the bear are Soft Suede, Crumb Cake and Sahara Sand inks. The bow was created by 2 step stamping in Blushing Bride and Sweet Sugarplum inks. For the cardstock, Blushing Bride and Crumb Cake were used. The large panel of Blushing Bride cardstock was embossed using the Big Shot with the Elegant Dots embossing folder. You can’t see much of it, but a strip of the Falling In Love Designer Series Paper was layered on top of the strip of Crumb Cake cardstock, down the middle of the card. We always have fun at card class, and at my other events. No, I’m not bragging – it’s the wonderful people who attend that make it such fun! 🙂 If you’re looking for a class to join, or one of my events to attend, just check the Events tab or click on my Calendar on the left side-bar. I need to schedule my upcoming classes, but my next event, which is my New Catalogue Kick Off Party has been scheduled – make sure you RSVP! You’re always welcome! Remember that stamp sets that are on the Retiring List will still be available until May 22nd; after that, then are available ‘while supplies last’ only. To order those, or any of the (non-retired/sold out) products that I’ve used in making these cards, click on the images below!